I miss being more carefree with my artwork and have decided to try my hand at more lettering and doodling and such. I'm so inspired by artists like Keri Smith and Mary Kate McDevitt (and dozens of other artists with an eye for charming illustration), and want to perfect my own style. I like the idea of working with words, quotes, simple images, and quirky shapes. I tend to be such a perfectionist these days, so this is my attempt at simply putting something on paper that is on my heart or mind, and just letting it be. 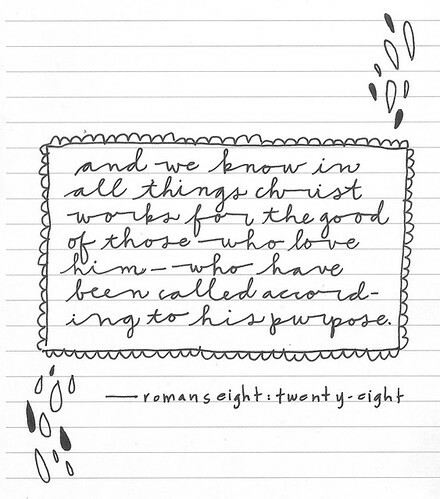 The above verse has been my favorite since I was about sixteen. Something about those words calm me and make me feel hopeful. Regardless of what is going on in my world. When I sat down to draw something last night, it was the first thing that came to mind. Oh, and in case you're curious, the pen I used this time around is the Pilot Varsity Disposable Fountain Pen (find it here!). I purchased it after reading a review on CRESCENDOh, and I'm absolutely in love. I'm talking serious swoonage over here. My next goal is to try my hand at some calligraphy, because I can't get enough of the modern calligraphy styles I'm seeing all over Etsy (for example, this shop, which is obviously too adorable for words). I'm so eager to try calligraphy myself, but have yet to actually pick up any pens or ink. Ah, well. One of these days, right? These are some of my favorite things to do. I'm obsessed with my own handwriting (sorry I'm not sorry) and I love the idea of playing with calligraphy, some watercolor and magazines for some tiny collages mixed with beautiful, inspiring words. Love you, friend! Glad you're checking out this creative outlet. Maybe you, Drea and I can do a wee bit of crafting when I'm there next month? your handwriting is so cute! i love it! I am having a serious urge to go to Joann fabrics today to load up on new crafting supplies. I finally have a craft nook in our new place and a strict budget to go along with it.... hehe! I used to have a calligraphy set. so fun! sharing a doodle is like sharing your innermost secret. woah. you constantly amaze me. I'm glad you're sharing this, because it's good to know people are still using pens! I admit I don't write too much, but I used to write in journals all the time as a teenager, and I doodled a lot from time to time. Sometimes I still do, when I'm working with kids, if they're coloring I get out a crayon and draw something. Usually I just do flowers. Yep. I'm originial. But I love your doodle. Your handwriting looks nice, and I love the little drawings on the side. this is lovely. I wish I liked my handwriting. I don't write enough anymore and I feel awkward with a pen now! Darn technology!